For many people being told they have a suspected enlargement of the cardiac muscle can cause a lot of worry and concern, but for most the problem does not cause any symptoms or long term problems and is not as uncommon as people may expect especially in the elderly and in those who have a high level of fitness. What Exactly is an Enlarged Heart? 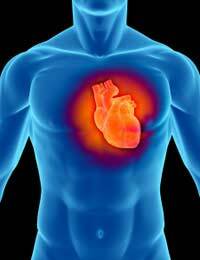 The term refers to a heart muscle that is larger than average for the age and size of the person concerned. Often the whole organ is not affected and only the exterior wall is thicker leaving other structures normal in size. There are a few possible causes of suffering from an enlarged heart with the most common being related to high blood pressure (hypertension) as the heart struggles to empty entirely and the blood is permitted to build up in the tissues. This can be an affect of vascular disease, cardiac disorders and sometimes relating to other medical problems such as a side-effect of medications. It is also possible than an enlarged heart can be the consequence of some cardiac conditions especially those involving defective valves. As there are often no obvious symptoms, the condition may be initially diagnosed following a routine x-ray from which the doctor may suspect that the cardiac organ is larger than it should be. An x-ray does not provide an exact diagnosis but is the first clue. Those suspected as having an enlarged heart will be referred for an echocardiogram which will give a more accrurate assesment of the tissues involved and the severity of the fluid build up. As mentioned, for many there will be no obvious symptoms whilst others may find that they are suffering with fatigue and may be short of breath. As the usual cause is hypertension the symptoms of this (if any) may be what prompts the patient to see their doctor in the first instance. Treatment options for an enlarged heart will often require the use of drugs to lower blood pressure, of which there are several different types. There may also be a need to take tablets that help expel excess fluids from the body.More often than not the deep rooted case of the enlarged heart is what requires treatment rather than the enlargement itself. The condition may or may not need treating depending on the severity and the symptoms experienced by the individual but if it is severe and not treated long term problems can result. @Trace - you should really be speaking to a doctor about this. Anyone reading this is not able to assess the symptoms without actually being there. I have a 4 year old girl. I have had her heart listened to once previously by the doctor and a slight murmur was put down to a temperature as they could not hear it a week later. A year later and now I've noticed that my daughter is now complaining that when she's playingand active, is getting out of breath and tired easily and in her words " her heart is beeping too loudly and hurts". Working in a hospital I try my best not to get over anxious myself but I've noticed she gets very reddy/purple in the cheeks, sweats a lot and looks a bit cyanosed around the nasal area. Any advice would be very much appreciated. Many thanks. I weigh 43kg and have been told I have an enlarged heart, is this due to being so thin?